Checking in on what the Cowboys rivals may do in the first round of the draft. It’s mock draft season and the Cowboys not having a first-round pick makes things just a little bit more challenging as they look to build the 2019 squad. While America’s Team won’t be selecting in the first round thanks to trading for Amari Cooper, the rest of their NFC East rivals will still be picking. ESPN’s Todd McShay has put together his latest mock draft (insider subscription required) and it’s only one round long so it doesn’t include the Cowboys; however, it does include their division counterparts. Here’s who McShay has each team taking as of early February. The G-Men are in sore need of a new signal-caller even though they will likely trot Eli Manning out for his 934th season in a row in 2019. New York boasts a bevy of young offensive talent in Odell Beckham Jr., Saquon Barkley, and Evan Engram so if they can land a quarterback to lead them all into the future they could be in solid shape. Haskins is thought by many to be the top available quarterback in this year’s class (which is somewhat weak overall). It would be interesting to see if he does ultimately last to the sixth overall pick or if another quarterback-needy team is desperate enough to jump the Giants in order to land him. That’s where an entire draft can change. Just like McShay has the Giants taking the first quarterback of the draft, he has the Redskins nabbing the first wide receiver in Oklahoma’s Marquise Brown. The bad news is that Brown is a playmaker. The state of Washington’s team overall is going to be quite curious in 2019 as their quarterback Alex Smith is rumored to be missing it all while dealing with the horrific injury he suffered near the end of last season. The Redskins will have to put together a lot in a short amount of time and a skill position player like Brown can certainly go a long way in that effort. This is perhaps the most terrifying piece of McShay’s mock draft as it has the Eagles landing some help along the interior of their defensive line next to Fletcher Cox. Yes, next to Fletcher Cox. 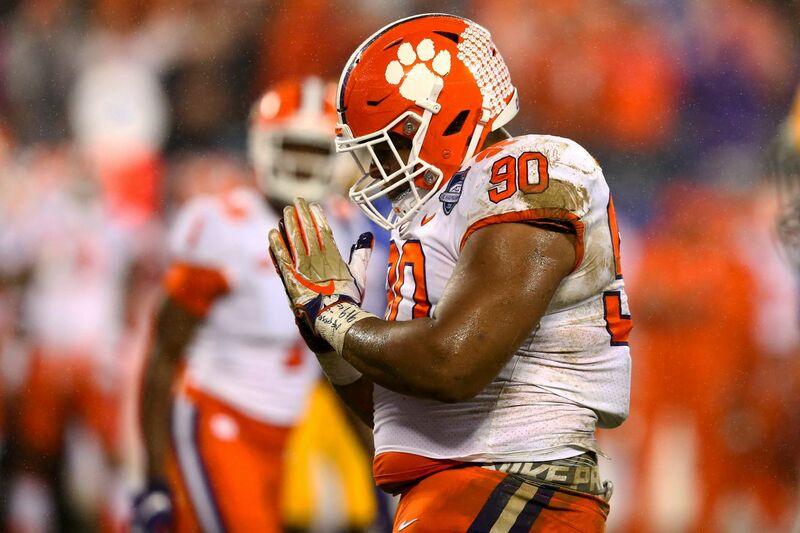 Lawrence did not play in Clemson’s CFB Playoff run that culminated in a National Championship, he and some teammates tested positive for ostarine, but his talents are impossible to ignore. The Tigers boasted one of the more ferocious fronts in all of college football and Lawrence was one of its headlining acts. Putting someone like that next to Fletcher Cox should indeed scare you. It’s often said that you build your football team in order to win your division. For a long time the Cowboys have had the best offensive line in the NFC East, a status that was put into question last season, and Philadelphia has done a great job of attacking that. Adding someone like Lawrence into the mix would make things all the more challenging for Dallas.